I know they are old-fashioned and that, in this day and age, it’s so much easier and quicker to nip down to Mothercare or Asda to stock up on baby clothes. But I’m currently obsessed with hand-knitted baby clothes. Not only are they cheaper than anything on the racks at Baby Gap, but they are cuter too – I’m sure of it! Since coming into the world last month, Thrifty Baby has been the very lucky recipient of some lovely presents from friends and family, including some gorgeous little hand-knitted items: cardigans, hats, mittens and booties. Until last week, however, I was too nervous to dress him in any of them. He has been such a sicky baby, producing such awesome quantities of laundry, that I baulked at the prospect of adding time-consuming hand washes to the mix. As you can see, now that he is getting better we are making up for lost time. 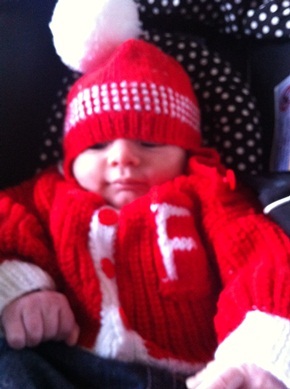 His letterman jacket and matching bobble hat were a gift from his Aunty Kathleen. I think he likes them as much as I do! Oh he is just gorgeous! Looking forward to the up-coming guest post. I too have been blessed with lots of hand knits for my boys (of er, mixed attractiveness) from kindly relations and neighbours and was inspired last year to actually knit some myself. First attempt: Success! Second attempt: Fail! At least with baby clothes if you’re chronically impatient like me, the finished article doesn’t take an age to make! Love the bairn & the photo. I have twin grandsons 27 Oct 2011. Bought them lovely “animal” hats from local library knitting group who give the proccceeds to RNLI. Othe rlibraries may have knitting groups. Great to see him looking so strong and sartorial at the same time! I don’t know many people that knit anymore. I LOVE making my kids stuff! It is a great way to save money and they just look so darn cute! Aw he is just the cutest little’un ever 🙂 And the size of that bobble on the hat is immense!!!! (ooh and I may be able to visit on 3/4th March if a gig enquiry i have goes ahead).